My wife and I recently bought our first house and we were in need of some assistance with IDing some flowers of ours the prior owners had planted. Aside from the flowers I know, hydregenes, and hostas I was hoping to get some help with the two I've attached here within. The orange flowers in front of the top picture are daylilies, aka ditch lilies. The pink ones are oriental lilies and the burgundy ones probably are too. The bush in the second picture may be spirea, but I'm not too sure. Someone else can check me on that. Welcome to the Forum and congratulations on your new house! Last edited by rainbowgardener on Sat Jun 25, 2016 11:44 am, edited 1 time in total. I agree that photo #2 is definitely Spirea! The IDs in the first photo sound about right as well. I think the orange are Tiger Lily instead of Day Lily. Agree with with the Asiatic Lily and Spirea! sorry, but I don't think so, re tiger lily. Tiger lilies are true lilies in the Lilium genus. note the leaves all along the flower stalk. Daylilies are not actually lilies, in the genus Hemerocallis. They have a tuber not a bulb. There's probably some confusion because I think some people mistakenly call the common daylily tiger lily. We DO call them Tiger Lilies! 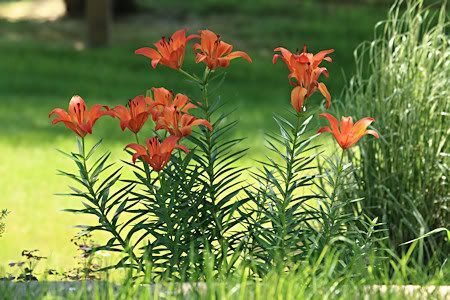 I was confused when you said Ditch Lilies, because we've always known Ditch lilies as Tiger Lilies here. I've heard them called by all 3 names. Hemerocallis is the genus name. The other flowers in the top picture are regular Asiatic lilies. Bush looks like spirea to me too.